Christianity, unlike the pagan religions that preceded it believes in the presence of a transcendent and incarnate God. For early Christian architects the challenge was how to express in material form the ideals and presence of an immaterial God. The western Roman Catholic Church adopted and evolved a model based on the horizontal axis of the Roman basilica. 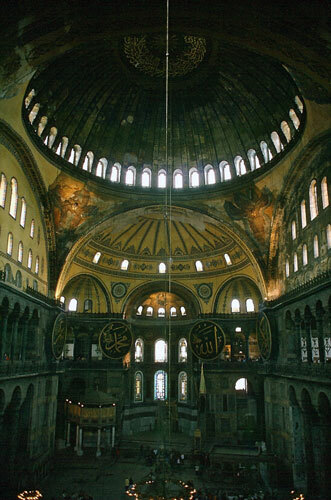 In the east, the Byzantines and the Eastern Orthodox Church developed a layout based on a centralized plan and domed architecture. 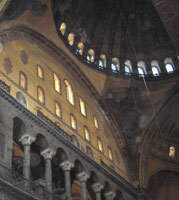 The Hagia Sophia is considered the finest example of Byzantine ecclesiastical architecture. 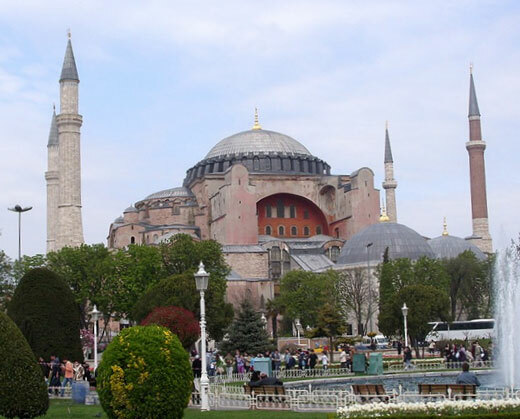 It was built as the Cathedral of Constantinople (Istanbul, Turkey) by Emperor Justinian between c. 532 – 537. The central dome of the church was made possible by use of pendentives. Invented by the Romans it was adopted and further developed by the Byzantines. 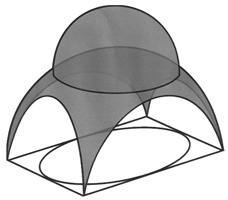 A pendentive is a type of construction that allows a circular dome to be placed over a square space. The pendentives are the concave triangular segments that are created when four large arches rise upward from the four edges of the square space and transition to the circular base of a hemispherical dome. The pendentives receive the weight of the dome and then concentrate it downward along the tapering mass of the pendentives to the four corners of the square base. Since the spaces beneath the large arches are essentially non-load bearing large windows can be used to fill the interior with light.